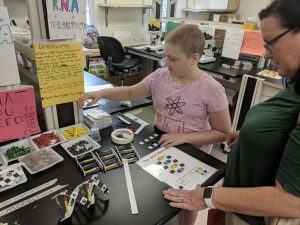 At the end of August, WiSE Outreach hosted the 2nd Annual WiSE Fun with DNA Camp with the Dolan DNA Learning Center (DNALC). 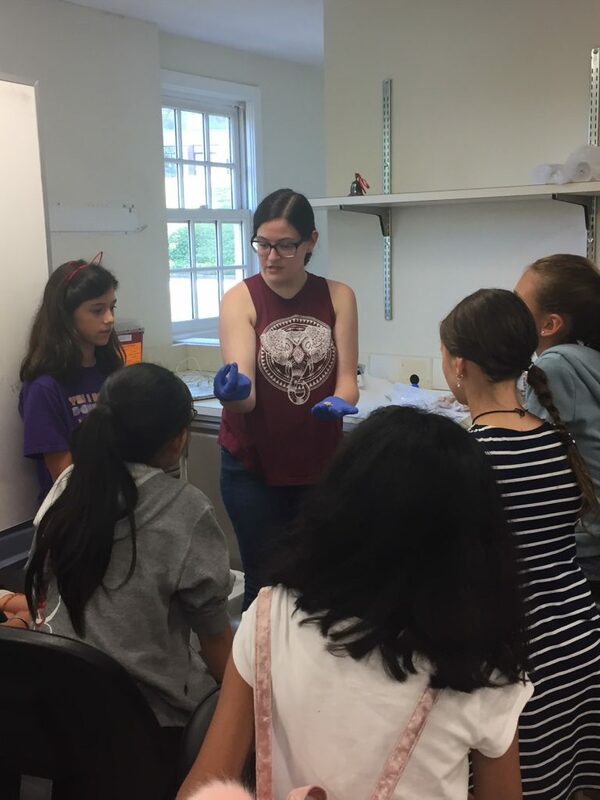 This is the only DNALC camp for girls only and is the only camp to take place at the Cold Spring Harbor Laboratory main campus in a real laboratory. After traditional DNALC Fun with DNA camp classes during the day, including building a cell model, extracting DNA from bananas and spit, creating a model DNA molecule, and examining mutant organisms under a microscope, the 20 girls joined WiSE to end the days with special WiSE-led activities. 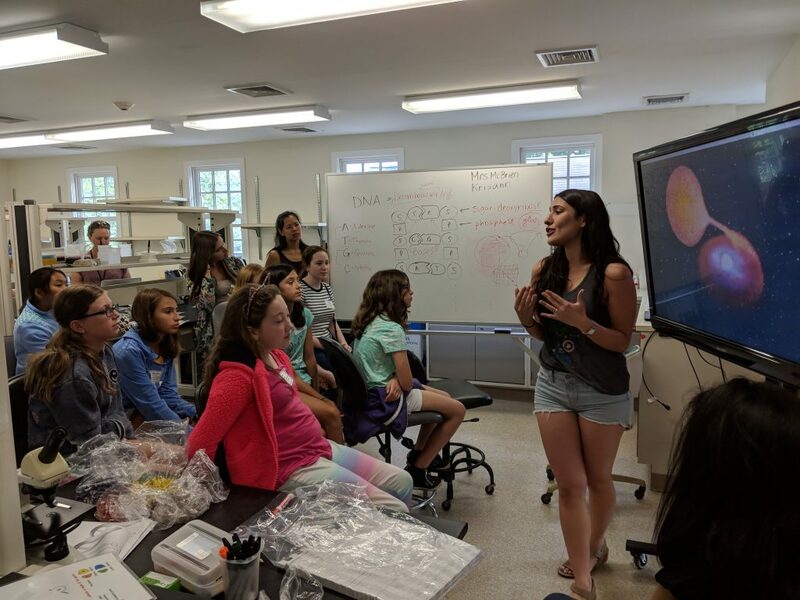 On the first day, CSHL graduate student Judy Mizrachi got the girls excited about astrophysics. She discussed the interesting research she did with NASA on special particles called neutrinos. She explained the life cycle of a star and showed the girls SOFIA, the largest, most sensitive observatory on an airplane. The girls were fascinated by Judy’s very unique astrophysics experiences and had many questions for her regarding dark matter and black holes. Plant Day was next as the girls toured the CSHL Uplands Farm with Farm director Tim Mulligan. 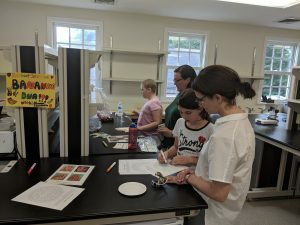 The girls were first introduced to the work of former CSHL scientist and Nobel laureate Barbara McClintock, including her work with transposable elements in maize. 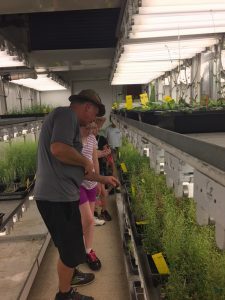 Though it was a bit hot to tour the greenhouses, the girls were still given a taste of the organisms used by the CSHL plant department, including Arabidopsis, duckweed, corn, and sorghum. 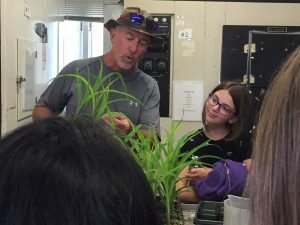 Tim ended his tour with a short talk about how climate change is impacting agriculture and the importance of sustainable farming practices before the girls were sent home with potted bean seeds to try out their newfound green thumbs! On Wednesday, WiSE President Ally Nowlan tackled immunity and vaccinations. 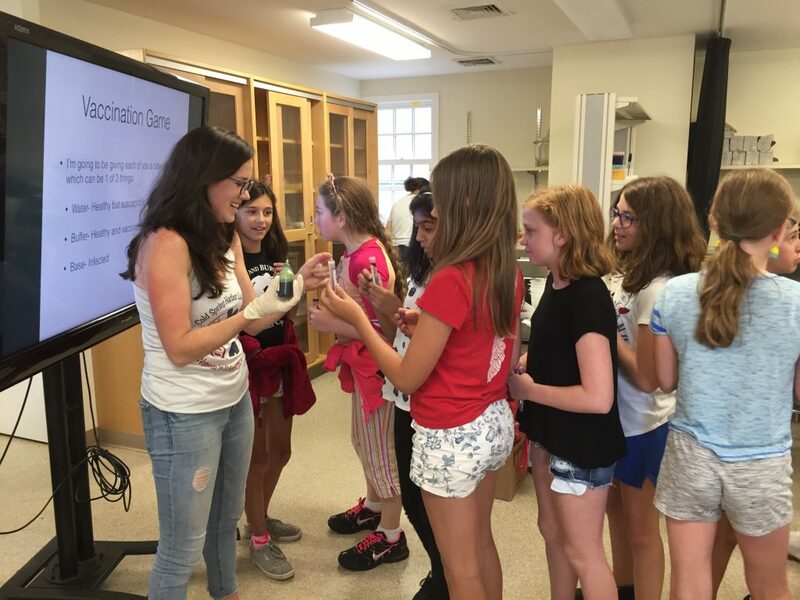 After an interactive discussion about how vaccines were first discovered, and how false claims about the MMR vaccines link to autism have led to an increase of Measles cases, the girls used basic chemistry to apply their understanding of herd immunity to simulate the spread of a contagious disease. Each student was given a solution that contained either water (representing a healthy but unvaccinated individual), a buffer (“vaccinated”), or a base (“infected”) and they went around the class swapping their solutions a few times. When we revealed whether they had been infected using a pH test, we saw that when only 10% of the population is vaccinated, a disease can spread quite easily. When we vaccinated a greater percentage of the population, the spread of the diseases was dramatically reduced, thus exemplifying the power of herd immunity. For the last activity, the girls rotated through 3 neuroscience activities. At one station, the girls examined real preserved brains. They checked out the anatomy, felt the grooves, and were taught the different regions and their functions. The other two stations used Backyard Brains equipment. The girls used electrodes on muscles to convert the energy to sound that they could control with contractions and relaxations of the muscles in their arm. The favorite station of the day allowed the girls to control a claw with their own contractions to pick up a ball as an example of neuroprosthesis. 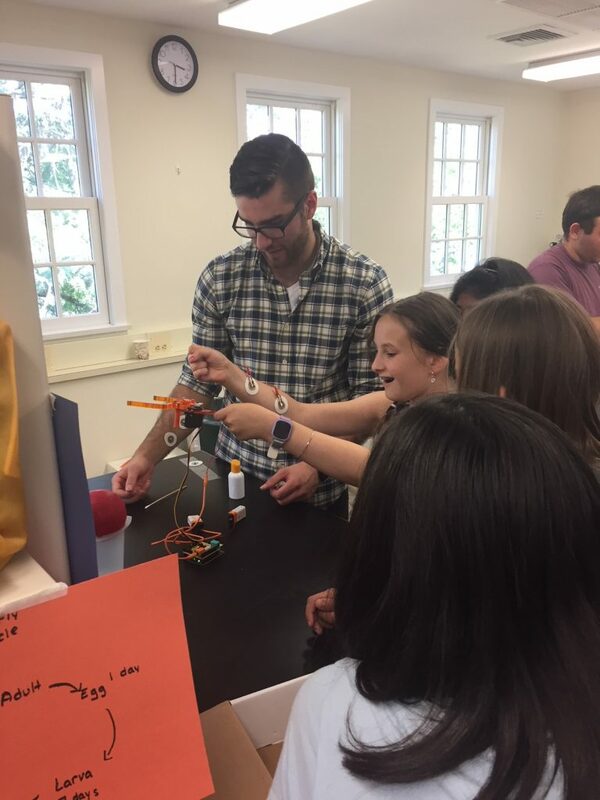 The camp ended with parent day, which included a tour of campus and a mini science fair. 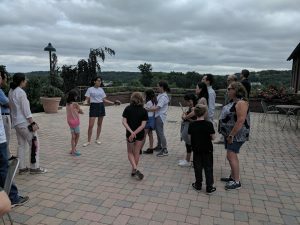 The girls showed their parents the activities they worked on during the week and everyone got a chance to check out the beautiful CSHL campus. Thanks to our tour guides Tzvia Pinkhasov and Diogo Maia e Silva! The second year of our all-girls camp was another success. The girls thrived in the unique learning environment we created, engaging in activities with excitement. Our 12 WiSE volunteers were not only helpful in teaching the activities, but also inspired the girls to ask questions and be curious. Our volunteers were great role models for the girls and we are very thankful for their support and willingness to be mentors. We look forward to next year’s camp, which we hope to provide a handful of scholarships for so we can reach out to those who wouldn’t normally have the chance to experience such an inspiring program.